BISS 7.28.11 - Hot Buttered Rum / Katdelic / Topaz, Brian Jordan & Eric McFadden / Zigaboo Modeliste / Blues Traveler!! Is that Canadian bacon we smell? No, it's a big huge Canadian Festival. Come out and hoot and holler for BISS favorite, The New Up so they can the win finals tonight @ The Red Devil Lounge and get to play a big huge Canadian Festival! You'll smell so good after that, that you might want a nibble.....of THE NIBBLERS that is, getting down at The Boom Boom Room tonight. **Congrats to Joanne!! Friday, oh Friday, how that word just rolls off of a BISS Listers tongue. 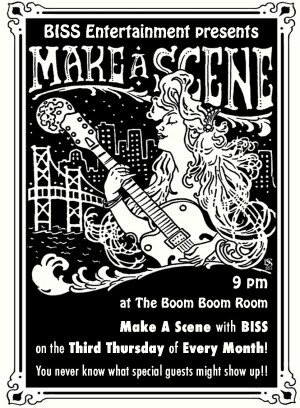 ... Start out your night smelling like Soul Groove Fried Chicken n' Waffles Sandwiches at Happy Hour (5-8) with the BISS List at the Boom Boom Room. Yes, really. Yum!!! It's a succulent boneless breast wrapped in bacon, battered, southern fried, nestled between two maple-loved waffles, and served up with a side of spicy maple barbecue sauce. **WIN A SANDWICH!! There's a whole plethora of other ways you could smell on Friday Night. You could smell dirty, if you are getting you some KID ROCK at the Shoreline. Or you could go for sweet and sweaty with HOT BUTTERED RUM at the New Parish. **WIN TICKETS!! ** Or you could smell juicy at KATDELIC at the Boom Boom Room.....There will be "fruit" bottoms galore. **Congrats to Gwen!! Sunday...you can smell delicate or funky or both if you're ambitious...THE SAN FRANCISCO BALLET has a free performance at Stern Grove at 2pm. Then it's going to smell like funky chicken at 4pm at Pier 23 when ZIGABOO MODEISTE cooks up the funk and the Queen & Princess do their chicken dance. **WIN TICKETS!! ** We LOVE Sundays with Zig at Pier 23!!! Let's just keep rolling into next week while we are here and it still smells so good...Plans smell even better!! Weds is PLEASURE SESSIONS @ Boom Boom Room, Thurs is GOOD ENOUGH FOR GOOD TIMES (members of GALACTIC & CHARLIE HUNTER TRIO) @ BBR, Friday is New Monsoon, Sean Leahy & Friends, Kiyoshi Foster @ Great American Music Hall (Happy Birthday Sean Leahy!! ), Also Friday is JUNO WHAT?! @ Boom Boom Room, Saturday is Mickey Hart Band @ The Independent, Saturday is also Ghosts Of Electricity @ Brick And Mortar Music Hall, Late night Saturday, more JUNO WHAT?! Sunny says......"Smelling good is important, and you always smell good when you smell like BISS." Guitarfish in SF!! featuring many of the artists performing at the festival!! "Red Devil Lounge, San Francisco, CA"
"Upstairs at the Swedish Hall from Cafe Du Nord , San Francisco, CA"
"Blue Jay Cafe , San Francisco, CA"
"Cafe Du Nord , San Francisco, CA"
"Smiley's Schooner Saloon , Bolinas, CA "
"Pier 23, San Francisco, CA"
"Black Oak Ranch, Laytonville, CA"
"Palm Ballroom, San Rafael, CA"
"The Union Room, San Francisco, CA"
"Jerry Garcia Amphitheater (McLaren Park), San Francisco, CA"
DMISSION IS FREE, BUT A DONATION OF $100 OR MORE IS GOOD FOR AT LEAST TWO SEATS IN OUR RESERVED SECTION. CHECK THE DONATION TAB ON THE LEFT HAND SIDE FOR MORE INFORMATION. "Milk Bar, San Francisco, CA"
"Golden Gate Park, San Francisco, CA"
"Bottom of the Hill, San Francisco, CA"
"Pier 38 , San Francisco, CA"
SF Sketchfest presents: Two Shows in One Night!